Since 2000, the Downtown Sheridan Association has had the opportunity to wine and dine our community members for a night during our Annual Wine Fest event. This year the event is scheduled for Friday, March 2nd. VIP ticket holders will be able to have an exclusive look at the wine and beer vendors beginning at 5pm. General admission attendees can fill their glass starting at 6pm and a sophisticated spread of hors d’oeuvres will be available throughout the evening. 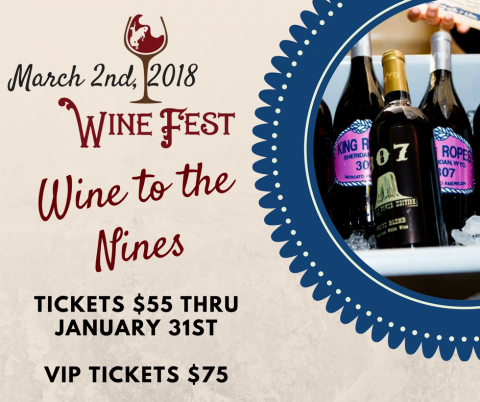 This year we are implementing a theme- “Wine to the Nines”- and invite anyone who is looking to have a fine time to purchase tickets and join us! Wine Fest is the most important event of the year for the Downtown Sheridan Association. Many of our downtown initiatives are funded with the revenue we collect from the ticket sales and sponsorships of this event. A successful Wine Fest means a successful year in general for our organization. With the dollars collected at Wine Fest, we reinvest in downtown events and projects including the 3rd Thursday Street Festival, Sheridan Farmer’s Market, and the vibrant flower baskets that line either side of our main street and Grinnell Plaza to name a few. The ongoing efforts and support that our community shows by attending our promoted events, especially Wine Fest, are what helps to keep our downtown buzzing and thriving. The Wine Fest will feature over 100 different wines and beer from across Wyoming and Montana. With so many participating vintners and brewers, we can guarantee that there will be something for everyone who attends. Vendors are given the option to participate in a category for our “Best of Show” award that will be presented the night of the event. This is truly a peoples’-choice award and will go to the vendor who receives the most votes from the guests who attend and are able to sample the offerings. Additionally, there will be a number of destination packages and hand-painted wine glasses decorated by local artists that will be available for bidding. We really do our best to make this a one-of-a-kind event for the year and enjoy putting on an exciting evening for everyone! This event would certainly not be possible without the continued support from our sponsors each year. We have three levels of sponsorship and appreciate each and every business and individual who chooses to be involved. At the Downtown Sheridan Association, it is our members, our sponsors, and our volunteers who truly make the difference in what we do. Tickets for the Wine Fest are available on our website www.downtownsheridan.org. If you are interested in learning more about our organization or are interested in getting involved, please contact us at 307-672-8881.